research, cooperation and partnerships. As Associate Researcher at the Royal Institute of Strategic Studies, he coordinated and formed part of several research teams within the same institution. 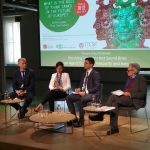 Author of several national and international publications such as: “Protection of Cultural Heritage and Human Rights,” in James A and R-NAFZIGER SCOVAZZI Tullio (eds. ), The Cultural Heritage Of Mankind, Hague Academy of International Law, Martinus Nijhoff Publishers, Leiden / Boston, 2008, pp. 251-296. In EMNES, he contributes to the research area on institutions and institutional reforms. Politiques de Paris (Sciences Po), and a Ph.D. in Economics from the Institut d’Etudes Politiques de Paris (Sciences Po). Nora teaches a number of courses including international economics, microeconomics, economic development, public finance, and European policies. She has collaborated with the OECD MENA Corporate Governance Unit, with the United Nations Research Institute for Social Development (UNRISD), with the Centre d’ Economie of the University of Paris 1 Pantheon- Sorbonne. She is a member of a number of research networks including EMNES and MEDRESET-rethinking the Mediterranean. Her areas of interest include trade policy, trade in services, social policy and public policy. analysis, international trade, quantitative policy analysis and rural development economics. He has been team leader or Agroeconomist member of research projects and studies funded by the EU, the World Bank, USAID, IFAD, UNDP, FAO, GIZ and the Moroccan government. In EMNES, as a senior researcher, Pr. Ait El Mekki contributes to the research area on regional integration for the case of Morocco. the Senior Economic Advisor at the Oman Capital Market Authority (CMA) for 6 years (2007–2013). Dr. Magableh holds a PhD in Economics from University of Western Sydney, Australia. Previously, he was an assistant professor of Economics at the Hashemite University (2002-2007). Prior to pursuing his PhD study, Magableh worked as an Economic Researcher at the United Nations Development Program, and he also worked as a tutor and part-time lecturer at Yarmouk University & University of Western Sydney. His expertise over 20 years covers various areas, such as research, teaching, consultations, public sector, executive experience & management, training and capital markets. Manchester Business School, from the University of Manchester. He attended several trainings related to science, technology, innovation and entrepreneurship management and evaluation. After one year of experience as a commercial engineer, he joined the National Center for Scientific and Technical Research (CNRST) in 2002. He managed a national research program as well as international research cooperation programs from 2002 to 2006. He has been a member of the Moroccan Incubators Network (RMIE) since 2005. He is currently managing CNRST’s Diaspora Incubator in addition to European projects supporting cooperation between Morocco and EU in the fields of STI and FINCOME program to promote the contribution of highly skilled Moroccan Diaspora to the development of Morocco. 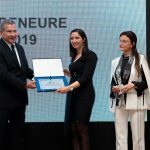 Mr. Azzioui conducted and contributed to several studies and projects dealing with marketing, incubation, entrepreneurship, and innovation at national and international levels. He organized, contributed and chaired many national and international workshops and conferences addressing research, innovation, business incubation and entrepreneurship issues. Mr. Azzioui was the coordinator of the Euro-Mediterranean Innovation Space (EMIS) task force. He was a country correspondent of Erawatch the European Commission’s information platform on European and third countries national and regional research and innovation systems and policies. Mr Azzioui is an active member, advisor and mentor at Startup Maroc the leading NGO supporting innovative startups in Morocco. He is also a mentor at The Moroccan banch of The Silico Valley accelerator called The Founder Institute He was an elected board Member of Middle East and North Africa Incubators Network (MENAinc) and a member of the international network called Science Parks and Innovation Centers Experts (SPICE group). In EMNES, he contributes to the research area on private sector development and leads the entrepreneurship survey. Dr Rihab Bellakhal is an Assistant Professor in Quantitative Methods at Tunis Graduate School of Business, University of Manouba. She holds a Ph.D in Economics from University of Tunis El Manar and University Paris 1, Pantheon-Sorbonne. She is associate researcher at ITCEQ. Her research interests include economics of education, labor markets and micro-econometrics. Her research papers are published in scientific journals such as British Journal of Industrial Relations and Economics Bulletin. In EMNES, Dr Rihab Bellakhal contributes to the research activity on human capital, migration and labor markets. Soumaya Ben Khelifa, is Assistant Professor in Finance at IHEC. She holds a PhD d in Finance from IHEC Carthage in Tunisia in April 2016. Her areas of research are: Asset Pricing, Hedge Funds, International Finance, Market Finance. In EMNES she contributes to the research area on finance. Moez Ben Tahar is assistant professor of economics at Faculty of Economics and Management, Sousse University, Tunisia and associate researcher at LEFA research centre at HEC Carthage and. He holds his PhD in Economics from the University of Nice-Sophia Antipolis. He is member of several research programs (European Commission, FEMISE, ERF, RIAD, IDRC and more). In EMNES, he contributes to the research areas on institutions and institutional reforms and labor markets. Boutaïna Bensalem is a professor in the School of Politics at the University Mohamed V of Agdal-Rabat and associate Researcher at IAV. She holds a Ph.D. in Civilisations from the University of Bordeaux-Montaigne. Much of her work focuses on International relations, History and politics. Miss Bensalem is a member of CEMMC research laboratory. She specially writes and lectures on Morocco politics and History, MENA Security, Media and Politics and Gender and Politics in Morocco. In EMNES, she contributes to the research area on institutions and institutional reforms. Representative of the Post-Graduate Studies, Economics Department, and Academic Leader for the Credit Hour System, Post-Graduate Studies, Economics Department, FEPS. She received the prize of Best M.Sc. and Ph.D. theses in Cairo University in 2005 and 2010 as well as the prize of Best Professor of Economics in FEPS for Post Graduates in 2015/2016. Awarded the Distinguished International Scientific Publication Prize in 2012, 2013, 2014, 2015 and 2016, respectively from Cairo University. She is specialized in Economics of Education, Economics of labor and Human Resources and Behavioral Economics. Member in the several professional Associations, for example, American Economic Association (AEA), Middle East Economic Association (MEEA), International Association for Feminist Economics (IAFE) and International Health Economics Association (IHEA). (IRES) and a senior consultant for different international organizations such as the African Development Bank and the United Nations African Economic Commission (CEA). 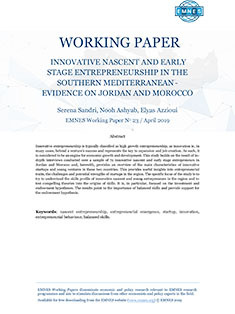 In EMNES he contributes to the research area on macroeconomic policy and employment in Morocco. and “Labex entreprendre” Units. She received her Ph.D. in Finance at the University of Montpellier. Her thesis adopts a comparative approach of strategies and performances of cooperatives and investor owned firms in different fields. She adopts an interdisciplinary vision within her research. Sandra has presented her work during international academic conferences and has published and is in publication process of scientific articles in peer review journals. Sandra current research focuses on financial performance and risk of different types of financial institutions. Sandra also holds a master’s degree in finance (104) from Paris Dauphine University and a Bachelor degree in Management from Saint Joseph’s University Beirut. She speaks Arabic, French and English. In EMNES, she contributes to the research on finance, financial inclusion and financial development. University of Udine., Italy. she has published numerous articles in internationally refereed academic journals. . Her Research Interest areas includes: Banking, Insurance, Innovation and Islamic Finance. notably to the development perspectives and to the issues inscribed in the development plans as well as studies of the impacts of policies, social and economic reforms. He is also interested in conducting studies concerning the social aspects of development of Tunisia such as the contribution of human resources of growth and evaluation and policy analysis of employment and income distribution and follow-up of the most important determinants of population growth, health system and social coverage system and analysis of their implications in the economic and social fields. University (Smith school of Enterprise and the Environment) and research fellow at the Economic Research Forum (ERF) and NETSPAR. She published and took part in the publication of several works, chapters or papers in her research fields. In addition to teaching and research, she has been involved with the World Bank, the ESCWA, the Moroccan (CNDH, CDG) and the French institutions (Ministry of Social Affairs and Employment Center) in studies about households savings, pension reforms and the expansion of social protection programs. She is engaged with the National Council of Human Rights (Morocco) to study the elderly situation in Morocco, to work closely with the institutions dedicated to old-age people (public, private and Ministry) to promote and to protect the rights of older persons. and international organizations. El Mahdi was the ex-Dean of the Faculty of Economics and Political Sciences (2008-2011), previously the Director of the Center of Economic and Financial Research and Studies (2005- 2008) and the Vice president of MSA University (2004-2005). 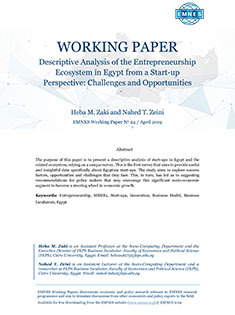 Area of specialization is in the fields of labor market studies, especially the informal labor market, and the Micro and Small Enterprises dynamics and performance, as well as several research studies on the macroeconomic fiscal, monetary and trade policies, FDI, industrial policies, education, social protection in Egypt and the Arab countries. El Mahdi has published numerous articles and chapters in books published internationally as well as regionally and in Egypt. She also led numerous research projects in various fields of socio-economic research. She contributed in drafting and revising the Labor Law 2003, the MSEs Law 2004 and the Social Insurance Law2010. She is currently working on drafting the new tax law for MSEs.. In the last fifteen to twenty years, she led teams of researchers and conducted over 30 socio-economic surveys for different domestic agencies/ ministries and research centers as well international organizations. She acted and still acts as consultant and policy advisor to several ministries and international organization such as ILO, UNDP, UNICEF, WB, ADB, UNIDO, Brookings Institute, ESCWA, JAICA, Friedrich Ebert Stiftung, Konrad Adenauer Stiftung, GIZ, Arab Labor Organization, WFP, MSMEDA, UNHABITAT,,,,,etc. University, under the title “on the Nexus between Constitutional Rules, Corruption and Economic Growth: An Empirical Analysis”. She got her M.A. in Economics in 2011, in which she studied the impact of corruption on economic growth in developing countries. She worked as a part-time researcher in Ministry of Planning in Egypt for three years, and as a research assistant for many Professors of Economics Department in different projects. She holds a B.A. in Economics from Faculty of Economics and Political Science, Cairo University. Her research interests include institutional economics, development economics, law and economics, economics of corruption and econometrics. She has some international publications on Institutions and institutional quality. and another master’s in applied mathematics jointly from Pierre-and-Marie-Curie University and Ecole Polytechnique. She is a member of LEDa-Dial research unit in Paris-Dauphine University. Her research interest is on Economic Modeling, Macroeconomics, Financial markets, Growth and Demographic change. In addition to research and teaching activities she is also involved in the organization of an annual conference on Pension, insurance and savings. inequality between skilled and unskilled workers in developing countries: the case of Tunisia”. Monia holds a master’s degree in International Economics from Paris Dauphine University (top student) and a Bachelor degree in High business studies from IHEC Carthage. She has published many academic papers in referred journals. Her research interests regard labor market, wage inequality and structural change. In EMNES, she contributes to the research on private sector development. research and consulting activities in the field of Development economics (Fiscal reforms, Demand Systems, Poverty and Inequality Analysis), Industrial Economics (Measurement of Efficiency and Productivity analysis) and Labor Economics (Inclusive growth and employment creation). He is a Fellow at the Economic Research Forum for Mena region and a member of the National Statistics council in Tunisia. He is senior researcher and co-coordinator of the Research Area on macro-economic policies and employment. University of Rome – TorVergata, and a Ph.D in Economics from University of Rome – TorVergata. He worked as Assistant Professor at German Jordanian University between 2011 and 2013, and has worked for Yarmouk University in Jordan since 2013. He was the Head of Department of Economics at Yarmouk University between 2016 and 2018. His research is mainly focused on development economics, micro-analysis, and macroeconomic policies’ impacts. , she has a bachelor’s degree from the Faculty of Economics and Political Science with major specialization of Statistics and minor of Socio-Computing in 2011. She is also a researcher at the FEPS Business Incubator (FEPS BI), Cairo University. She conducts surveys and reports in the field of “Innovation and Entrepreneurship” and related topics. Her research interests are in the areas of entrepreneurships and innovation, innovation diffusion and Social Dynamics and Governance. In EMNES, as a junior researcher, she contributes to the research area on Private Sector, Micro, Small and Medium-Sized Enterprises (MSMEs), and Entrepreneurship. Banking sector” with an overall grade of Excellent. Her recent publication’s list includes: – Elsaayed S., Samak ,N., and Hassouba ,T. (2014). Basel II and Credit Risk Management in Banking Sector: Applied study on the Egyptian Case. Research Papers Series. Economics Department. Faculty of Economics and Political Sciences. In EMNES, she contributes to the research area on finance. Dorra Mezzez Hmaied is a full Professor of Finance at the Institut des Hautes Etudes Commerciales (IHEC) – Carthage. She is in charge of the Finance Department and the Master of Research in Finance at the same institution. She has a PHD of the Paris Dauphine University. Her main research is on Banking and Financial markets in Tunisia published in Review of Middle East Economics and Finance ; Journal of Financial Regulation and Compliance, The International Journal of Business and Finance Research ; Journal of Money, Investment and Banking ; The Journal of Private Equity, etc. In EMNES, she is team leader and contributes to the research area on finance. Firm-Level Data”, to be defended in 2019. She got her MSc in 2015, with thesis entitled “Determinants of Export Diversification: An Empirical Application on the Egyptian Economy”. Since 2012, she has been teaching courses of International Economics, Money and Banking, Microeconomics, and Macroeconomics. Her research interests are International Trade and Macroeconomics. Her recent publication is Kamal, Y. and Zaki, C. (2018). How Do Technical Barriers to Trade Affect Exports? Evidence from Egyptian Firm-Level Data. Journal of Economic Integration, 33(4), 659-721.
levels, as well as carrying out specific research for relationship between education and employment. He is currently a member of the technical committee responsible for developing the National Employment Strategy. He participates in the achievement of studies on the Tunisian labor market within the Millennium Challenge Corporation (MCC) and the Euro-Mediterranean Network for Economic Studies projects. He published several studies in the website of ITCEQ, in the International Journal of Applied Decision Sciences and “Revue Valaque d’Etudes Economiques”. Applied Economics (ENSSEA). The first Thesis focused on empirical analysis in cross section and pseudo-panel of occupational choice in Algeria over the period 1997-2007.The second thesis focused in the situation of labor market in Algeria “The labor market in Algeria: Social Networks, Occupational Choice and Wages”. Accreditation to Supervise Research since 2015 from National School of Statistics and Applied Economics. Team leader since 2014 “Labor Economics and Social Protection” and Division Manager since 2018 “Social Economics & Human Development” at CREAD. Mainly works in the field of social sciences, specializing in the analysis of the labor market in the Middle East and North Africa (MENA) region. Main research fields are Social Networks, Labor Market, Segmentation, Occupation choice, Informal employment, Women’s employment, Segregation and Wage discrimination. Published in various national and international journals (last publication was Explaining the MENA Paradox: Rising Educational Attainment, Yet Stagnant Female Labor Force Participation IZA DISCUSSION PAPER). Participated in several research projects with national and international institution (last project was with ILO “Integration of graduates into the labor market” and with FAO “Decent youth employment in rural areas”. informal sector in Arab Countries. Her research topics are on socio-economic and living conditions in Arab countries. She has also be involved in research for EMNES on education, training and youth Labor Market circumstances in Morocco. for Economic Studies (ECES) for one year. He got his MSc in Economics, in February 2019, from FEPS, under the supervision of Prof. Chahir Zaki with a thesis entitled: “Natural Gas Demand Analysis: The Case of Egypt”. Since July 2017, he has been working as an academic coordinator for the Master Program in Law and Economics of the Arab Region (MLEA). His main fields of interests are macroeconomics and energy economics. international conferences. She published in renowned scientific journals. Rania research interests are in the areas of financial markets, international finance. She holds a Ph.D. degree in management sciences from the Institutes of High Commercial Studies IHEC, Tunis. applied econometrics, precisely, application on Human development and labor economics in Egypt and developing countries in general. She has published her research articles in different international peer-reviewed journals, including Middle Eastern Finance and Economics Journal, Advances in Management and Applied Economics, International Research Journal of Finance and Economics, and European Journal of Economics, Finance and Administrative Science. In EMNES, she contributes to the research on institutions and institutional reforms. (co)-authored several studies on EU and Near East banking regulation, as well as diversity in bank ownership and business models, small and medium-sized enterprises obstacles to growth and access to finance. Willem Pieter has further extensive experience in gathering and analyzing data, e.g. product prices, executive compensation, financial performance, and structure. Willem holds a Master in Finance, VU University, The Netherlands; Bachelor in Economics, Utrecht University, The Netherlands; and speaks Dutch, English and German. In EMNES, he contributes to the research on finance and private sector development. under the supervision of Professor Alban Thomas. During her stay in France, she worked as teaching assistant in Toulouse University (Université Toulouse 1-Capitole) and as research assistant in Toulouse Business School. In 2008, She worked as research assistant in International Food Policy Research Institute (IFPRI) in Washington, D.C. Since 2010, She worked as an economic consultant for different international organizations such as the UNDP-Regional Office in Cairo, World Bank, UN-ESCWA, UN-FAO, IFAD and UNESCO. She was a visiting scholar at Hamburg University in Germany (2012), at Chicago University Center in Paris (2013) and at the Humphrey School of Public Affairs, Minnesota University in USA (2014). She is a member of the Associate Editorial Board of New Medit- A Mediterranean Journal of Economics, Agriculture and Environment (2018), a fellow of the Summer Program in Social Science (SPSS) at the Institute for Advanced Study in Princeton (2018-2019) and laureate of the Programme Femme d’Avenir en Méditerranée- Sciences Po Paris (2016). She is the academic coordinator of the FEPS team in the Euro Mediterranean Network for Economic Studies (EMNES). She has several papers published in peer reviewed journals as Review of Income and Wealth (ROIW), Middle East Development Journal (MEDJ), Food Policy and New Medit- A Mediterranean Journal of Economics, Agriculture and Environment. Her research interests include applied micro-econometrics on poverty, food security, gender and human development in Egypt and other developing countries. Ms. Myriam Ramzy Michel is currently an Assistant Lecturer at the Department of Economics, Faculty of Economics and Political Science, Cairo University. In 2005, she graduated from the Faculty of Economics and Political Science with a major in economics and minor in statistics. Since 2006, she has been working as an Assistant Lecturer in the French Section and teaching many courses in Macroeconomics, Development Economics, Money and Banking, Mathematical Economics, International Economics, and National Accounts. In 2011, she obtained her Master’s degree in economics, with her thesis entitled “The Role of Innovation in Creating the Knowledge-Based Economy”. She is currently working on her PhD thesis and supposed to be defending it in 2018, with her thesis entitled “The Impact of Environmental Regulations on International Trade for the Most Important Agricultural Commodities between the European Union and Middle East and North Africa Countries”. Her recent publication is Ramzy, M. and Zaki, C. (2018). “Do Environmental Matter for EU-MENA Trade?”, Applied Economics, (forthcoming). Her main fields of interests are International Trade and Environmental Economics. include international trade, foreign direct investment and global value chains. He published several studies in the website of the ITCEQ. Universität zu Berlin. She is associate researcher at Yarmouk University. Her main fields of expertise are behavioral economics, institutional economics, and entrepreneurship. Her publications have appeared among else in the Journal of Economic Behavior & Organization, the European Review of Agricultural Economics, and Mediterranean Politics. For EMNES, she contributes to the research areas on institutions, private sector development and finance. Ph.D in Economics from Aix-Marseille University (France). He has carried out research and consulting activities in the field of Economics modelling and Development Economics. He has published numerous articles internationally refereed academic journals. His research and publications focus on issues involving growth and development, labour economics, applied economics and macroeconomic modeling. In EMNES, Seifallah Sassi contributes to the research area on macro-economic policies and employment. He is in charge to compile a database that includes sectoral data essentially employment and value added and he assist senior economist in order to prepare a comprehensive status reports that identify the trends of macroeconomic indicators, survey on employment policies and an assessment on the ability of Tunisian sectors to generate employment opportunities. conduct of monetary policy in Egypt. In addition to her research and teaching activities, Nesreen is also the assistant coordinator of cooperation program between the Faculty of Economics and Political Science and the United-Nations Children’s Funds – UNICEF Egypt and has previously collaborated with the Institute of Law and Economics at the University of Hamburg serving as the academic coordinator of the first double-degree Master program in Law and Economics in Egypt between Cairo University and the University of Hamburg. Nesreen holds a B.A. in Economics and a MSc. in Economics from the Faculty of Economics and Political Science, Cairo University. Her research interests include monetary and fiscal policy, applied time series econometrics, and macroeconomic policies of the MENA region. In EMNES, she contributes to the research on macroeconomic policies and employment. Economics from 1997 to 1998 and he was Head of the Department of Management from 1999 to 2000. He is the Founding Director of the Laboratory Quality and Marketing L-QUALIMAT. He is member of EDIMAP Network the Moroccan Association of Quality and Management and the Reading Committee of Marrakesh Law Faculty Journal. He supervised and assisted over 30 doctoral theses and published several articles and books. He holds a Phd in Economics and Agro-industrial and Food Management obtained at Montpellier I in 1987. He obtained his MSc diploma at l’Institut Agronomique Meditrraneen de Montpellier. In EMNES Prof. Sidmou is the scientific leader of the EUMF team and is involved in the research on the private sector. Mathematical Economics and Econometrics at the High Studies School in Social Sciences (EHESS Paris) in 1993. He has been guest professor at Virginia, USA and Galatasaray, Turkey Universities. He has published articles in different academic journals such as International Journal of Finance and Economics, International Economic Journal, Economic Modelling, Journal of historical economics, revue économique and Applied Economics and Finance. He has also published two books: «Higher Education in the Arab World”, Arab Center for Research and Policy Studies, 2017 and “Principes d’Économétrie”, Pearson Edition. October 2012. He has also lead and participated to different studies and research projects for national, regional and international institutions. In EMNES, he is co-leading the research area on human capital, education, innovation and migration. Dr. Zaki is currently teaching for undergraduate and post graduate students, many subjects some of which are: information Infra structure, Social network Analysis, Application of sociocomputing in modern information societies. Dr. Zaki founded FEPS Business Incubator in December 2016- the first Business incubator in Cairo university- and she is currently its executive Director since February 2017. She also Ex- Advisory board member of Micro Small, Medium enterprise agency- Ministry of trade since June 2017 till December 2018. She used to be the head of Communication unit of the faculty of Economics & Political Science from Jan 2015 till April 2017, as well as The head of ALUMNI and Recruitment unit, since July 2015 till April 2017. Dr. Zaki has received a variety of specialized training courses and workshops in Incubator management ( USAID), Pre- Incubation Entrepreneurship program ( Babson College Executive Program), Technology commercialization( UN ESCWA), Governmental and Institutional Decision Support Systems: Economic Track ( EU TEMPUS project), Project Mangement( DAAD).